Soon the warmer weather will be here and cyclists will be on the roads. The postures assumed by cycling can cause shoulder and neck pain. What can you do to relieve or prevent neck and shoulder pain due to the hunched over postures required of cycling while your neck is extended to see the road? Seeing a chiropractor can be quite helpful. If your lower body is tight, you are likely to get neck and shoulder pain, and you may have no idea of the problems elsewhere in the body. Unfortunately, most of us are unable to self diagnose ourselves properly. This is why you should see a professional and chiropractors are uniquely positioned to look at you, not just the symptoms of neck and shoulder pain. Chiropractors use a holistic approach to diagnose why you hurt. Most cyclists know that stretching is important – particularly the hip flexors, hamstrings and glutes. But how many of us pay attention to our shoulders and middle back? 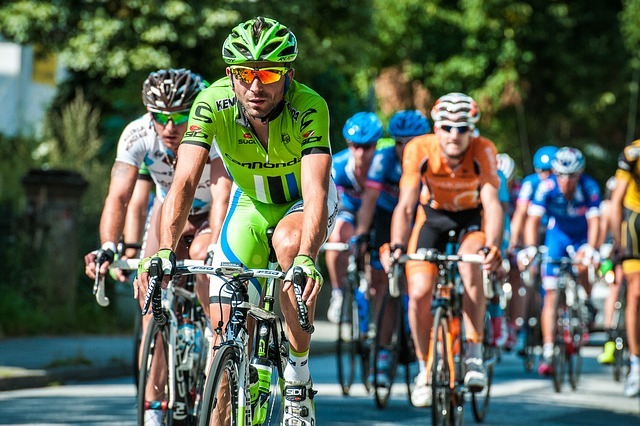 Adopting a traditional road cyclist’s pose on the bike can cause a rounding of the shoulders and tightness in the thoracic spine – the section between the neck and bottom of the rib cage. The same areas are affected by desk work, an activity which dominates the days of many amateur riders. “Anyone who spends most of their day at a desk needs to do something that takes them out of that position. That’s a problem for a lot of amateur cyclists – because their exercise is in the same position,” explained VeloPhysio’s Nichola Roberts, who treats cyclists via bike fits as well as physiotherapy.